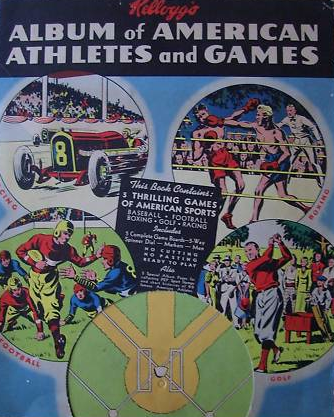 After seeing Wheaties succeed with a string of 1920s and 1930s pro endorsements (which birthed their enduring "Breakfast of Champions" slogan), Kellogg's built a competing stable of athletes and sports performers to push boxes of whole wheat cereal. 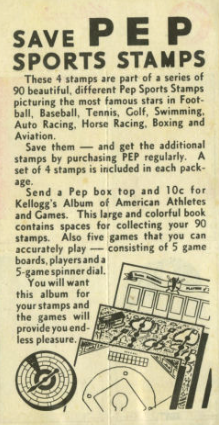 Their shotgun approach is perhaps best represented by today's set, the multi-sport (and multi-species) Sports Stamps, packaged in boxes of Pep wheat cereal. Kids could remove the yellow numbered banner, separate each stamp along perforations, and mount all 90 in a company-made album. Vintage fans might know Gabby Hartnett as a Hall of Fame catcher for the Cubs, who happened to post his last statistically great year in 1937 (career stats). So who are the other three? George Lott's polo collar betrays that he played the more genteel sport of tennis. He won several doubles titles in the early 1930s and must've still been well-known in 1937. 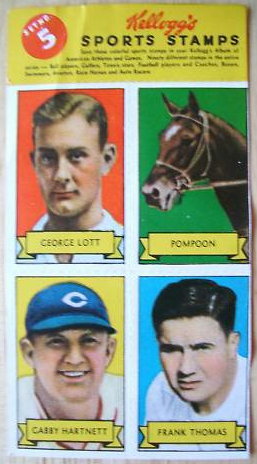 Pompoon won five major races between 1936 and 1938 before succumbing to a kidney infection in 1939. The college football Frank Thomas played for Notre Dame, roomed with The Gipper, and coached Alabama to significant success in the 30s and 40s. Frank was probably the best-known name on this panel in 1937. Pep's panel-stamp dichotomy gives collectors multiple checklist options. 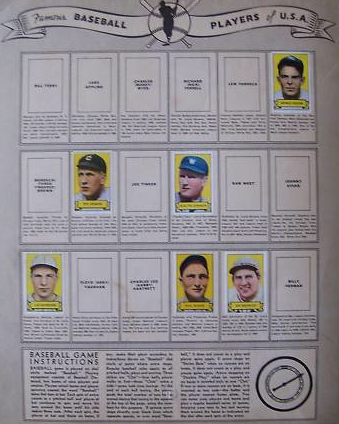 OldBaseball.com offers a hybrid, alphabetizing the players but including their panel number. UPDATE: eBay provided these Pep Sports album cover and baseball page scans! No idea about those criss-cross lines across home plate. Anyone know if that's really how fields looked in the 1930s and what the lines in foul ground demarcated? 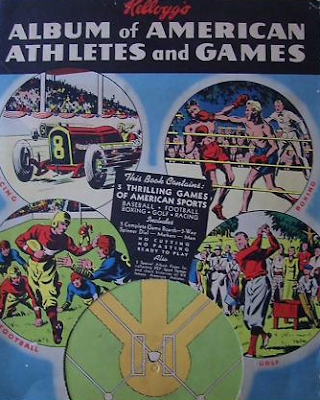 Inside, one page held all 18 baseballers. Value: Low-grade complete panels cost $20-$50, depending on players. Individual panels come cheap and I'd pay a few dollars at most. It'd be fun to find a complete album, but they might only turn up in auctions.